Japan is unique in having one of the most highly-developed elite running systems in the world, an enormous and growing population of amateur runners, and mass popularity among the general public in elite racing as a spectator sport. But like anywhere else there is separation between those elite and amateur worlds, the university and corporate teams, out of sight except for their televised races and rarely interacting with the public. 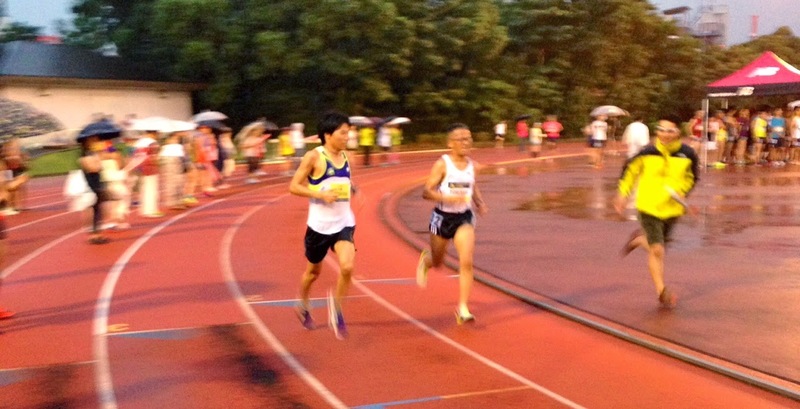 A university-aged pacer in a blue and white Otona no Time Trial singlet leads amateur runners in an early heat. One feature of the elite circuit is the time trial meet. Time trial meets are day- or weekend-long series of long-distance track races finely graded by target time. The largest of the them, Yokohama's Nittai University Time Trials series, had 45 heats of 5000 m in 14 hours in one edition last year, each heat with 30-40 runners ranging from serious amateurs in the early heats to Olympians and national champions in the latest, fastest heats. 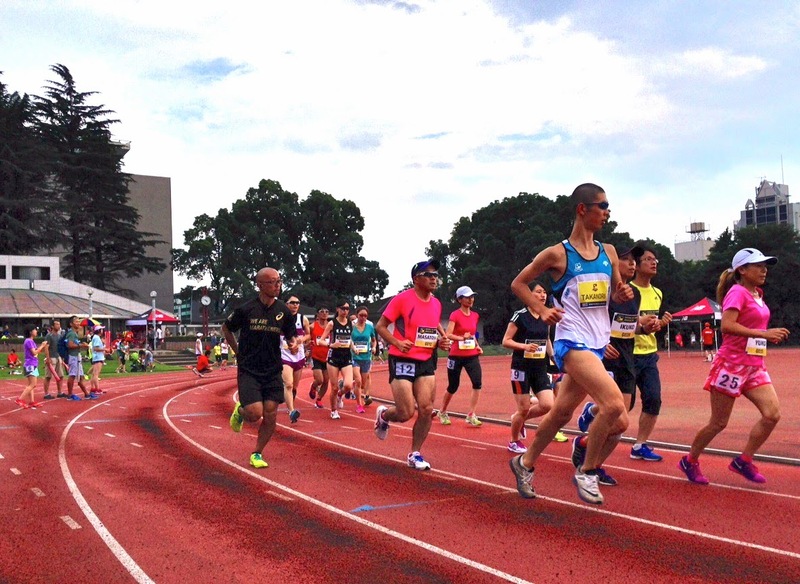 The atmosphere at the most elite meets like the Golden Games in Nobeoka and Hokuren Distance Challenge is electric, different from a regular distance carnival or track meet with supporters and fans crowding the track from the fifth lane outward, music playing over loudspeakers and an MC calling out encouragement to the runners and working the crowds. 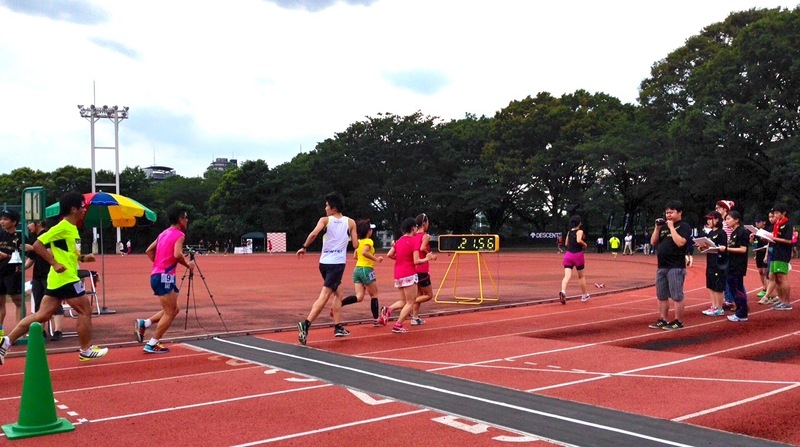 Another pacer calls out encouragement with one lap to go as Ekiden News staff work the finish area. For three years the members of the Ekiden News website have been working tirelessly to bring time trial meets further into the public eye. Dedicated fans trying to spread their love of all things Hakone, the Tokyo-based EN crew goes to every Nittai and other major time trials meets in the Tokyo area and travel the country going to GGN, and HDC and all the other big events, filming and documenting every heat with equal enthusiasm and respect, posting all the videos on Youtube and promoting them on Twitter and Facebook. Last year they made the logical leap and started their own time trial meet, the Otona no Time Trial ("Time Trials for Grown-Ups") at Oda Field in the heart of Tokyo's Shibuya fashion hub. On July 20 the meet was held for the second time. 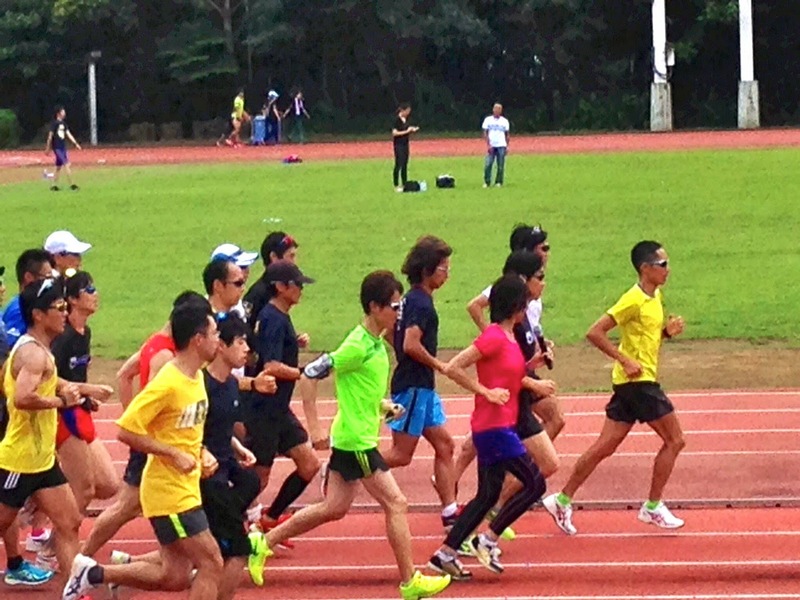 Yoshiki Kawauchi paces one runner while meet organizer Takeshi Nishimoto runs alongside giving encouragement. 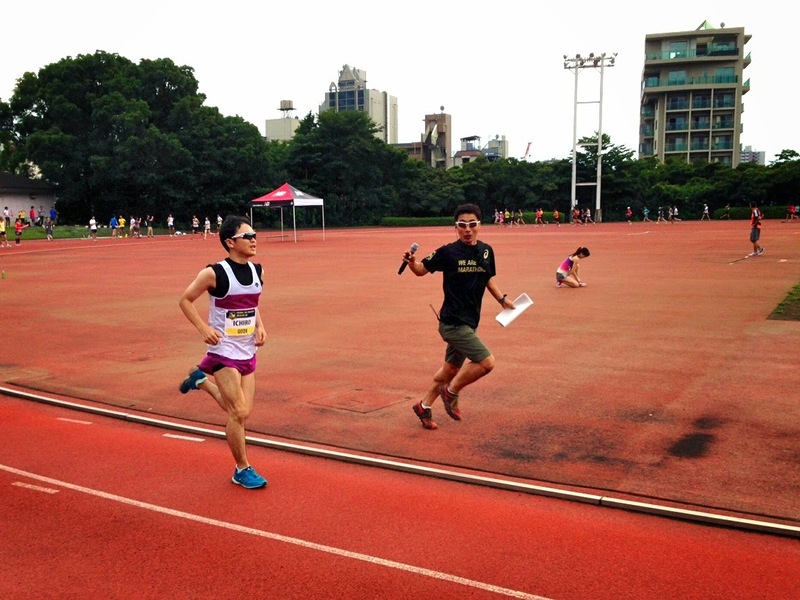 The Otona no Time Trial meet is the brainchild of Ekiden News founder Takeshi Nishimoto, an effort to bring the excitement of Golden Games in Nobeoka and this elite racing experience to the average runner. All the ingredients were there: fourteen heats of 5000 m graded by time plus 1500 m heats and a kids' 1000 m, professional timing and photography, lap counting, a sound system pumping tunes, spectators encouraged to stand on the track in lane five and cheer. Naoko Takahashi, in pink, paces a group while giving them advice over the sound system. And there were unique touches: individualized bibs with each entrant's first name from the 30 min+ runners in heat A to those trying to break 15 in heat N, pacing and personal encouragement in each heat from the likes of Olympic marathon gold medalist and former world record holder Naoko Takahashi, Yuki Kawauchi's middle brother Yoshiki Kawauchi, and university and corporate-league athletes brought in for the job wearing custom-made Otono no Time Trial singlets with "Follow Me" on the back, and small-scale sponsorship from New Balance, Asics, Descente, Zoff sunglasses and Red Bull to make it all possible. Nishimoto interviewing on the run. While the rest of the Ekiden News crew worked as photographers and in the finish area, throughout it all Nishimoto worked as MC, walking the track and infield as he called out encouragement to each runner by name and urging them on to beat time goals, told the crowd who was on PB pace and jumped in with his mic to conduct micro-interviews on the run with pacers and racers, all with the same energy and enthusiasm as if it were a "real" race. The energy rubbed off, people from the early heats staying to watch the faster ones and the numbers on and around the track growing as curious onlookers from a nearby Brazil festival came in to watch. Despite a sudden thunderstorm that delayed the final four heats the crowd was thick by the time of the final, fastest heat, and even though it was only won in 15:08 people were as excited and raucous as if they were watching a National Championships, energy they shared as much with the last-place finisher in the last heat as with its winner. A pacer in an early heat guides one runner in to the finish as a race staff member directs those finishing and those with one lap to go to separate chutes. Having experienced for themselves the excitement of what it's like to be an elite, there's no doubt that even the 6- and 7-minute kilometer hobby runners came away from the Otona no Time Trial with both increased interest in elite racing and renewed dedication to their own running. In a place where almost all races are organized by government bodies and other cautious, slow-moving and slow-thinking committees, this was something truly innovative, an event put on with complete professionalism by fans outside the system to share the magic of the thing they love with others, a race by the people for the people but, critically, with an atmosphere of achievement regardless of ability one step beyond a simple "everyone's a winner." Within that nuance lies the core of what Nishimoto and Ekiden News sought to communicate about elite running to participants, and in that respect the Otona no Time Trial was indeed a win for everyone.